Successful start in Egypt: TROX and TIBA exhibit at HVAC-R Egypt Expo. 120 companies from 19 countries, and 5863 visitors: From 11 to 13 April, Cairo was the venue for HVAC-R Egypt Expo, the only exhibition for the HVAC-R industry in Egypt. TROX TIBA was there as a platinum sponsor.TROX TIBA presented the entire TROX product portfolio to the visitors. Exhibits included TKM, PURELINE, RFD-Sirius, various grilles and diffusers, VAV terminal units such as the new Type TVE, and TROX X-FANS smoke extract systems. Tarek Sherif comments on the very successful exhibition: “TROX wanted to show its huge innovative potential and demonstrate its wide range of products and services – and we have certainly achieved this goal: TROX products attracted considerable crowds. Our announcement to manufacture locally was received extremely well. We must not forget that TROX is the only international company that has taken this step in time for the construction boom that is to be expected for the New Capital Cairo and other construction hotspots in Egypt.”The TIBA El Manzalawi Group, whose headquarters are in Cairo, is one of the largest enterprises in the HVAC industry in Egypt. TIBA manufactures and sells air conditioning components for both the residential and commercial sectors. TROX and TIBA have already been working together closely for two years in the manufacturing and marketing of air handling units and fan coil units.Not long ago, the two companies also signed a joint venture agreement at the ISH 2019 trade show in Frankfurt, Germany. 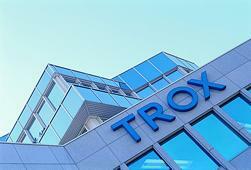 A new company, TROXTIBA, is currently in its founding stages. TROX and TIBA are going to manufacture ventilation and air conditioning components, and specifically components for air distribution. The new joint venture aims at serving the Egyptian market as well as the markets in the Middle East and in North and East Africa.